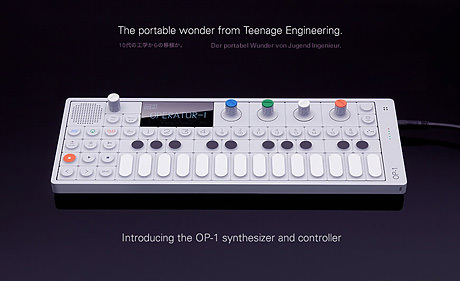 OP-1 - trying too hard? What do you get when you leave a Casio VL-tone and a Sinclair QL in a room together with some Barry White and the lights down low? The OP-1 that's what. Teenage Engineering clearly have aesthetics on their side with this one, and it seems to have an awful lot going on feature-wise as well. I think I saw this on Peter Kirn's awesome site, but it certainly has spread like wildfire amongst the more electronic music sites. So having teaseed us with a ransom note, and allegedly kidnapping a world champion DJ to get our attention, Tribologix have finally come clean and sent me the final press release before we can all get our hands on it - the TX45 that is. 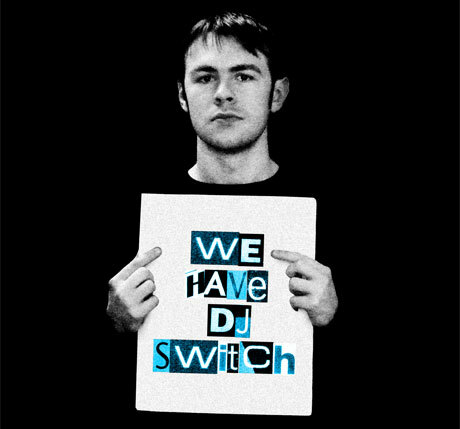 And the guy with DJ Switch - he's an actual scientist, and not some actor in a smock acting all nutty professorish. But there is an amount of nextlevelness to see this year despite the crunch. I'll start reporting later today once the press releases start to flood in - well perhaps trickle in anyway - followed up by my usual prompt coverage. While others at Messe might be partying until the late hours of the morning, I'll be beavering away in my room for you guys. Actually, I'd rather be writing than laying face down in a Frankfurt gutter anyway - I'm way too old for that these days. 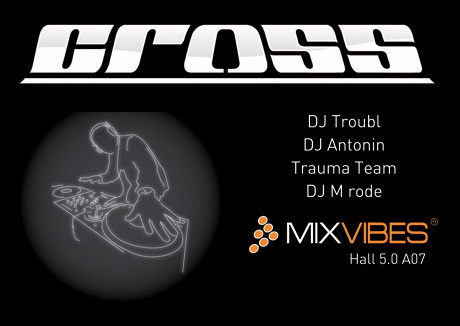 MusikMesse just wouldn't be the same for me without Mixvibes. I think they started going the same year I did and I've watched them grow every year since. This year however seems to be more about Cross - their new DVS system. Last year it was strictly beta and no vinyl control, but now it comes with vinyl spinning goodness. In the last couple of years, DJ Tech have come from nowhere (well Hong Kong actually) to being a name that people are beginning to know. 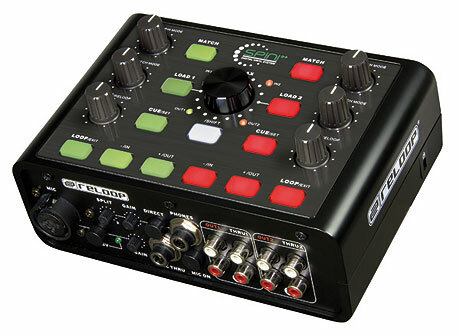 Initially, there was a crop of very much me too OEM stuff, but in recent months, a few original products are coming out of their labs, in particular the Kontrol One seen at NAMM. DJ Tech will be at MusikMese showing off some new gear, and hopefully after that I'll get to unbox the gear they set me at Christmas for review. 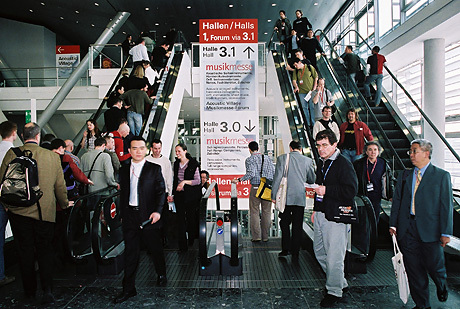 As MusikMesse approaches, releases begin to leach out from the various PR departments. One such release is Stanton's sequel to their diminutive but powerful touchy feely but awfully named DaScratch aka SCS.3d. So what do they do to follow it up? Bring out a companion that slots neatly between 2 DaScratches - and call it DaMix. Another epic fail on the name front (called 3m from now on) but looks more like the general purpose controller people want. While other "scenes" have a massive range of replacement parts, the complete lack of standards sees the DJ scene largely without a 3rd party market. 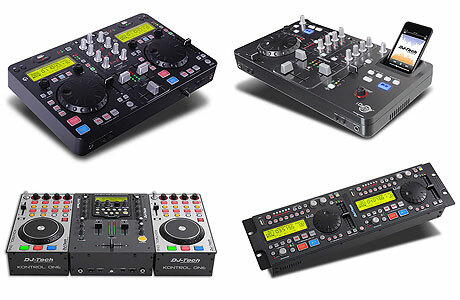 Not much is designed to be replaced in DJ gear, but the crossfader market is one that has seen growth in the last few years. While manufacturers like Penny & Giles and Infinium have offered OEM faders, the Pro X Fade was the first real 3rd party offering that allowed you to swap out your stock fader for something else. But then the Innofader hit the scene, proving that there is a market for such things. I've got 3 opinions for you to browse, plus a bit of a preface to the review as well. Cast your minds back to NAMM, when Native Instruments brought out a handful on new goodies - Maschine being the biggie, which completely overshadowed the release of the small but perfectly formed Audio 4 DJ. "What's the point?" cried some people. Well this dear reader is the point, and is something I tried to guide you towards without actually spilling the beans. Traktor Scratch Duo is the entry level Traktor software - essentially a 2 deck version with a few bits left out, but still more than enough to have the rest of the market quaking, especially when you can have it for a street price of just $349/�299/325 euros. Oooofff... kidney punch for the DVS makers right there. Yes - a little feeling of deja vu here is you've read the last post. But Spin!2+ has one seriously great difference and that's the interface. Some genius decided it would be a great idea to add MIDI buttons to an otherwise untouched and ignored box, thus making it a lot more useful than ever. Yes - Reloop's "world novelty" is pretty hot but hopefully doesn't add to the price too much. 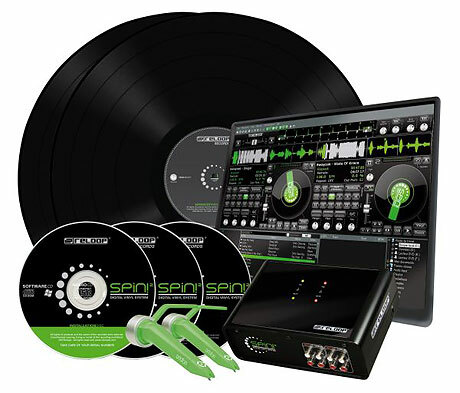 Reloop dipped their toe in the ever growing DVS pool with the stark white and green Spin!, complete with shiny new interface and rebadged and reskinned MixVibes software - and seemed to turn no heads at all. Well it's back, repainted, rereskinned and reinterfaced. Check out Spin!2. Last year at MusikMesse, Reloop rolled out a couple of new MIDI controllers. It was quite possible to miss them in amongst the growing mountain of similar controllers, especially given Reloop's lack of profile in comparison to the big boys. Well here's the sequel - Digital Jockey 2. It's had a repaint (very Knightriderish) and probably some other stuff as well, but nothing jumps out to be honest. And there's an interface and non-interface version for those of you who want choice. Being on home ground at MusikMesse next week, Reloop have a slew of new and improved products for us to pour over. But instead of waiting until 10pm on the night before I fly, the info on their new stuff is here. 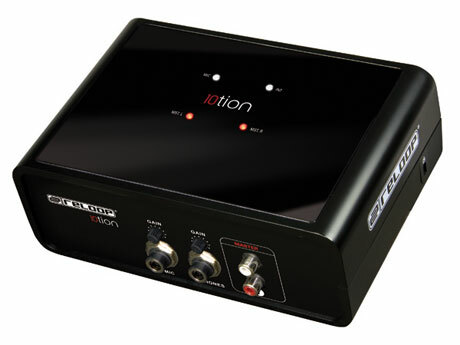 First up is the engagingly named 10tion 4 in 4 out USB sound card. I'm still trying to work out if that's supposed to be tension, TEN-SHUN or even lotion. Ransom notes via email? Kinda defeats the point of the whole cut and paste malarky, but when something like this drops into the inbox, I sit up and take notice. 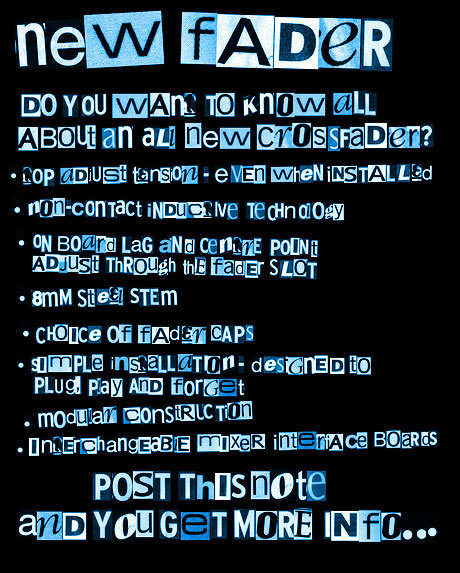 A new fader you say? Post this to get more info you say? Ooooh... intimidating and exciting all at the same time. So whoeveryouare - duly posted. I kept up my end of the deal - I and the 400K skratchworx visitors came alone and didn't tell the cops. If you're a regular round these parts, you'll have seen the birth and subsequent rise of Dylan - offspring of brother in law NdB and new baby DJ sensation. Like his dad, he loves messing around with toys, or as we grown ups like to call them, expensive to replace consumer electronics. 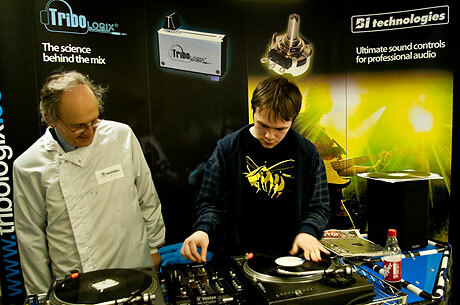 And when faced with Numark's NS7 in the skratchlab, there was little we could do to keep him from quite literally playing and drooling all over it. My scepticism about iPhones as real music making block rocking tunes spinning devices has just taken a huge knock with the announcement of Apple's iPhone 3.0 beta today. Why? Well is this one simple fact - Apple is now allowing access to iTunes tracks, something that they just didn't allow before. There's not much that grabs my attention on TV these days. Failing US TV dramas and dodgy Australian soaps are a staple diet, but one show that always makes me stop and pay attention is Five's The Gadget Show - a reference that will miss 85% of my target audience. Nevertheless, when my favourite bespectacled worm rocking gadget guy puts out a Twitter based plea, I respond accordingly. So here's the deal - Jason Bradbury needs people to descend upon London flashmob style. Be at Somerset House, London this Friday at 1pm just for an hour and you'll be appearing on The Gadget Show - all several hundred, thousand or million of you. The digital age does take some twists and turns doesn't it? Back in the olden days, you had to make gear that conformed to established norms and metaphors. But having no 12" media - well actually any media at all - to lug around, the device you choose to rock the dancefloor with can be pretty much whatever comes out of the wacky minds in R&D labs around the world. 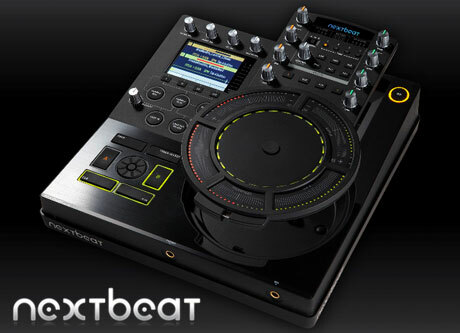 And this NextBeat NXT-1000 is about as leftfield and outside the box as they get in the DJ scene. Not wishing to blow my own trumpet in an obviously self gratuitous way, but skratchworx has pretty much got the world exclusive on Numark's NS7. I have a And they want me to share my experiences with you coming up to launch date, via the multiple mediums of words, pictures and video. So in true gear pr0n style, I did a quick unboxing photoshoot for you to... um enjoy in the privacy of your own bedrooms. 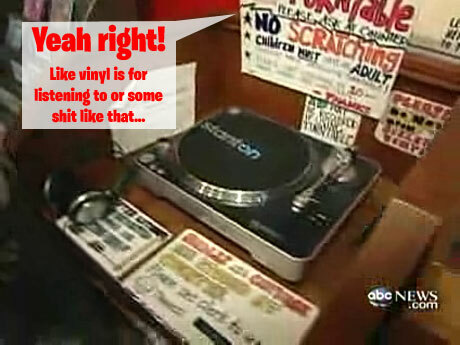 Vinyl making a tiny comeback? Much has been made in the media about a resurgence in the popularity of our beloved vinyl, but I've largely switched off from these stories because the core of the info seems anecdotal, with little more than percentages being offered - hence my scepticism at the actual amount of vinyl being bought. But this little gem turned up on the Stanton site while researching the previous story. Just for the briefest moment in time, I thought that someone had gone quite insane and actually brought out some all new decks. 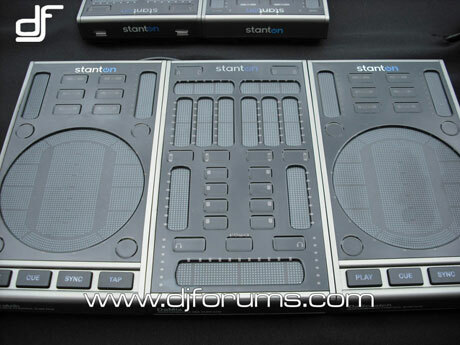 Well technically in some way they are new, the new Stanton T.55 and T.92 decks offer things that their T.52 and T.90 decks don't... but aside from USB on the 55 and a very luverly paint job on the 92, I'm buggered if I can see what the differences are. djay - cheap - act fast! A real quickie here. You'll have heard me harp on about djay - the Mac only DJ software that give you a closer and very visual spinning experience. Well I just read on the djay Tweetcast or whatever the correct terminology is that they're having a weekend sale of djay at maczot, although at the time of writing you only have 14 hours left to nab it for just $30 instead of the already reasonable $50. Grab the demo from the djay download page, try it for a few hours and then snag it cheap if you like it. 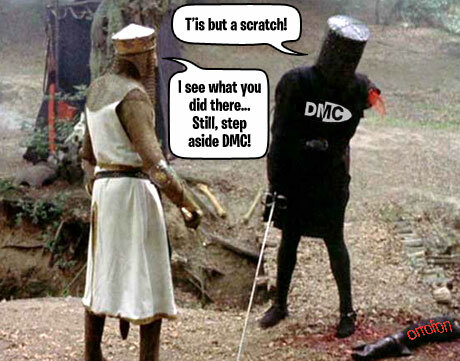 DMC marches on - insists "it's just a flesh wound"
It's fair to say that DMC took a little more than a body blow when major sponsor Ortofon had to bow to the realities of the global economic downturn and pull out of supporting the never ending DJ battle. Undaunted, DMC refuses to acknowledge the wound and is carrying on regardless - business as usual - and verily UK heats have been announced, as well as dates for the UK and world finals. The recession is biting hard, especially in the UK, and I recently reported that Arbiter UK crashd and burned, leaving a number of big name music companies without distribution. But out of the ashes of the collapse comes an all new name - 2twenty2 - and they've been busy sifting through the wreckage to give these brands a new home. 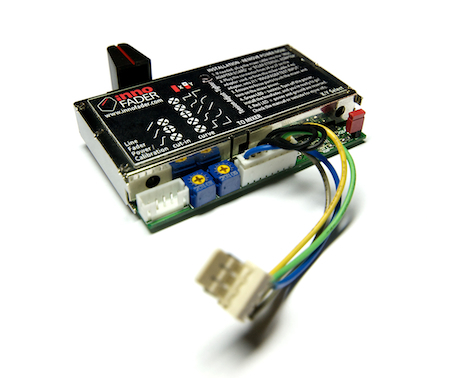 NS7 - now a website too! NS7 eurphoria is hitting the streets. Traveling around various sites, counters are in full effect, counting down to the time when you can lay your hands on this much anticipated Serato ITCH based all in one controller. 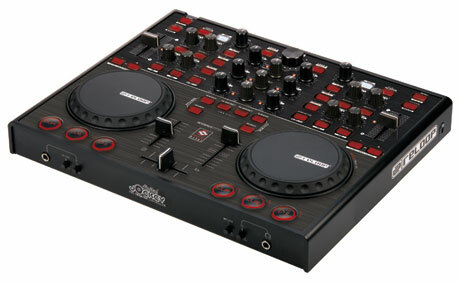 And such is the expectation being heaped on this beast, Numark has made a site all of its own, quote logically called www.ns7controller.com. And before you go and check, ns7.com is being sat on by domain squatters. Bastards. And so it begins - the new blood has donned their writing trousers and spewed forth the first of many new reviews on skratchworx. 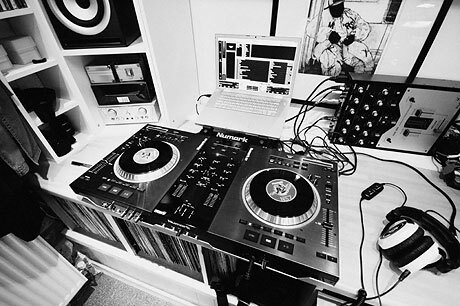 Some, like this will be catch-up pieces, and doing the honours is the UK's Johnny 1 Move - DMC regular, gigging DJ and self confessed gear geek. 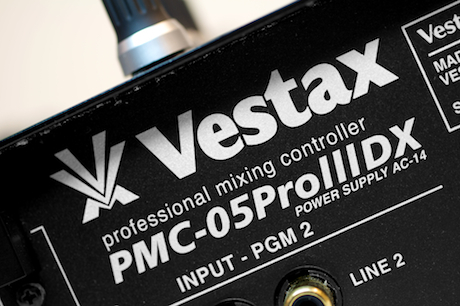 As I cast my eyes around the crowded flat surfaces of the skratchlab, I spied the perfect box for him to check out - the immensely named Vestax PMC-05ProIIIDX. Suiting Johnny's scratch sensibilities and giving him a chance to rock SSL and Traktor Scratch at the same, he set about giving it a thorough workout. Sorry for the inconvenience Loungers, but for some reason, the database has just emptied itself, rendering the skratchlounge quite dead. While it's not the most trafficked forum on the planet, I do like it to at least work. And yes, skratchworx does have a forum for those who never realised it. Well it did until around 20 minutes ago anyway. UPDATE: According to my hosts, the database is temporarily locked due to "some issues". Hopefully this means it'll be back soon. 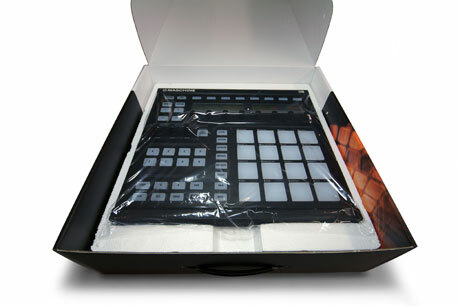 The courier knocked at the door with yet another box full of new heat, this time being Native Instruments' Maschine groove box. As I'm not doing the review, I figured I'd just send it right off without a look. But the box sat there, whispering sweet nothings... "you know you want to open me" it chirped. "OK - just a quick peek" thought I. Big mistake. The rest of the afternoon and evening was spent shooting gear pr0n and bashing buttons.